I’ve been posting quite a bit of positive news from Israel lately; I hope nobody is getting bored. Anyway, here’s another story that will top the last one – the Israelis are now launching a fullscale space effort. They have had a space program for a while, but all it did was launch a few satellites and train a few astronauts, like the ill-fated Ilan Ramon. Now Israel’s space budget has just been increased from 10 million to 165 million shekels, so maybe they will soon have rockets capable of putting astronauts in orbit, rather than rely on the Europeans, Russians and NASA to launch anything besides satellites. For the whole story, check out this video. I find this especially interesting because we retired our own space shuttle program last year, so the United States no longer has any manned rocket capability. Are the Israelis going to take our place up there? This announcement reminds me of a science fiction novel by Poul Anderson, The High Crusade, which ends with a starship commanded by an Israeli meeting the descendants of some knights who captured an alien spacecraft a thousand years earlier, and conquered the empire that sent it. It also reminds me of the final scene from Mel Brooks’ “History of the World Part 1” (see the video below). Who’d have thought Mel was a prophet as well as a comedian and movie director? Those clever Israelis have done it again! This time they have developed an electric car that is larger, more practical, and more affordable than the other electric cars produced to date, even the much-lauded Chevy Volt. It has a range of 100 miles, so here in the US it is not feasible for out-of-town trips, but because Israel is so much smaller, you can drive almost halfway from one end of the country to the other before recharging. And here it would work just fine for a daily commute, to work or for shopping. When the battery runs low on electricity, it can be replaced with a fully charged battery in four minutes. While this sounds like it is good for the environment (and it is), Israel is working on the car for reasons of national security; most of the world’s gasoline comes from countries that hate the Jewish state. Still, whether or not this technology can be applied elsewhere, more power to them – literally. We are coming up on the end of January. So far we have had four months that were cold enough for snow, and during that time there were exactly two snowstorms. My co-workers are starting to suggest that we’re having a mild winter because I brought milder weather with me from Kentucky. I haven’t had to worry much about driving in the ice and snow, anyway. However, yesterday I got another idea – we haven’t heard from Al Gore lately. In recent years, whenever he made a speech on global warming, a terrible winter storm would strike somewhere in the country. For example, he was in Washington, D.C., addressing Congress at this time in 2009, and we got the worst ice storm in Kentucky’s history on the very same day. Is there any reason we blame the former vice president for that storm? More than one global warming conference has been cancelled by these seasonal tempests, and it has happened often enough for the Urban Dictionary to give the phenomenon a name – “the Gore Effect.” Myself, I feel that God is having fun at Gore’s expense, showing that He has more control over the weather than any politician does. And God will do it again if anyone acts like a modern-day King Canute, by promising to make the oceans stop rising. Wait a minute, didn’t Barack Obama promise that in 2008? Mr. Vice President, if you are at home in Tennessee, waiting for the Superbowl or just enjoying the millions you have made over the past decade, please stay there. We like it when the only concern we have during the winter is keeping warm, and here in New England, when winter storms come along, we get hit the hardest. Since October, I have told everyone about the problem I have had with mice infesting my Connecticut apartment. So far I have caught four of them, when they fell into the large plastic bucket next to the stove. Now, surprisingly, it looks like there aren’t any more. Over the past weekend, I baited the “trap” by dropping two peanuts into the bucket. Not long after that I heard something jumping in the bucket, but when I went to investigate, there was no mouse in the bucket. And one of the peanuts was missing, too. Later on, the other peanut disappeared the same way. Evidently I was dealing with a supermouse this time. Not only could it jump out of the bucket, something the other mice could not do, it was also strong enough to take a big Virginia peanut with it, shell and all. When I replaced the bait on Monday, I propped the lid on one side of the bucket. I figured that if the opening was half covered and the mouse returned, unless it could aim where it jumped, the lid would keep it from getting out until I arrived and snapped the lid firmly on. However, nobody went for the peanuts. On Wednesday, I did another test, by dropping another peanut on the floor nearby. In the past, when I did that, the peanut was always gone within two or three hours, but as I write this, it’s still there. According to the locals, it has been an unusually mild winter. We had temperatures in the 50s last Monday, and the forecast has it going to 56 degrees today; we have also had more rain than snow. Perhaps the supermouse went outside and never came back; an owl or a cat could have caught it. I’m crossing my fingers in the hope that my pest problem is over. Okay, now that the first winter storm of the season is over, I can tell you the whole story. Fortunately we had plenty of warning. Also, we didn’t have tree limbs coming down or thousands of people losing power, the way we did with last October’s storm. The snow started falling late Friday night. By the time it stopped, on Saturday afternoon, we had six or seven inches of the stuff, a heavy snowfall by Kentucky standards. For a while I wondered if I was going to be able to go out that weekend, because the driveway was full of snow and my landlady was in the hospital with a broken ankle. Luckily, her son called a snowplow service, and they cleared out the driveway at 2 PM. The snowfall hadn’t completely stopped by then, but now I was motivated to go out and shovel the sidewalks around the house and my apartment. A month ago I made a deal with the landlady: if I could put my car in her garage when the weather was bad, and when I was out of town for Christmas, I would shovel the sidewalks for the winter. Because this winter has been so mild, I definitely got the better part of the deal until Saturday. Well, when I went to fulfill my part of the bargain, I got some help from the tenant in the other apartment, so it wasn’t as bad as I expected; he shoveled the sidewalks in front while I did the ones in back. At 5 PM I went out to pick up my prescriptions from Wal-Mart, and do a week’s worth of laundry. The laundromat is in the same shopping center where I mailed that letter on Friday, and what a difference a day made! Instead of the bumper-to-bumper traffic I faced on Friday, there was hardly any traffic at all, because nobody wanted to be on the roads, even if they were treated for ice and snow. I was alone for much of the time I was in the laundromat; on the weekend that’s unheard of. On Sunday I went out again to attend church, but otherwise it was a quiet day. On Monday morning we got a form of precipitation the weatherman called “ice pellets.” To me it looked the same as sleet back in Kentucky, so I don’t know why they give it a different name in Connecticut. That was followed by rain for the rest of the day. In addition, the temperature stayed in the 40s all day and night, so most of the snow was gone by this morning. On the other side of the parking lot from where I work, there is a small swamp. A sign gives it the politically correct name of “wetland,” but it’s the same thing, a place full of trees and standing water where rain and melted snow go after they fall on us. In the summer I heard frogs croaking from there, but otherwise didn’t think about it until today, when I saw three deer walk out of there at the end of my workday. I thought deer didn’t like coming this far into town. Let the record show that Connecticut has wildlife after all. My cousin Sherry had her second child yesterday, at 4:48 PM. Another boy like the first, Gabriel. 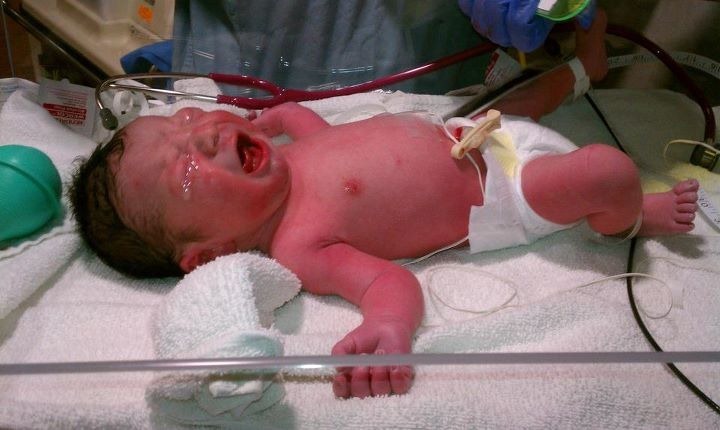 He weighed in at 7lbs, 4 ounces, and is 20 inches long. Both Mommy and baby are doing fine. Congratulations from the Kimball family! I forgot to mention last week that Monday, January 16, marked the fifth birthday of this blog. Wow, who’d have thought I would have enough to say to keep active here for five years? Every year in January I have to renew the license plates of the family cars. In Kentucky it was only a big deal in the first year when I went for each car (2007 for the Buick, 2009 for the Nissan). I gave Leive instructions on how to do it for the Nissan, but with both the Buick and I out of state this time, I had to come up with a different plan for the Buick. At first I considered getting a Connecticut plate, but when I went on the website listing instructions for CT, ouch! If I get my tag here, they will nickel and dime me to death! Instead of listing the total cost upfront, they listed a whole bunch of fees which I might need to pay. For instance, they will charge $10 to check my VIN number, to make sure the car hasn’t been reported as stolen. I’m not sure, but it looks like around here, I would pay no less than $80 to get registered. By contrast, the cost for a new tag for either of my cars in Kentucky is in the 30s. Because of that sticker shock, I called the county government back home to see if I could just mail the required paperwork and a check to Kentucky. They told me yes, as long as I have a Kentucky address, so I prepared an envelope to send them last Friday. That was the easy part; the hard part proved to be getting to a mailbox, which I did after work. Oh! Why is the traffic always worse at 5 PM on Friday than at any other time of the week? Are there really that many more people working on Fridays? There certainly aren’t where I work. For most of the trip, the cars and trucks barely moved at all, and it seemed that the traffic lights I met were short-cycling, only staying green long enough to let three vehicles pass through in each lane. After I got to the mailbox, I chose to take a detour that went a couple of miles out of my way, to get to some streets that weren’t so busy. In all it took me a whole hour to get home from work, when normally it takes me half an hour. And even half an hour seems too slow, when I can get to work in 10-15 minutes during the morning rush. The good news is that the auto tag laws aren’t enforced here in Danbury. For months I have noticed cars driving in front of me with very expired tags. Usually the sticker on the plate gives a date in 2007 or 2008. Why don’t the cops stop drivers who have been going that long without renewing? It seems to me that there are enough violators to fund the police department, just with fines from traffic tickets.